The Fiat Professional Fiorino, the original small van that established a new commercial vehicle segment, has been refreshed for 2016 to consolidate its market position and offer even more to the professional user. The new Fiorino retains the compact dimensions that make it perfect for use in cities, agile in traffic and easy to park, without sacrificing any of its remarkable load capacity of up to 2.8 m3 or payload capacity of up to 660kg. The evolution of the Fiat Professional Fiorino introduces some modern design touches, inside and out, with new features that will propel it to the top of its class in terms of performance, running costs, comfort and functionality. In terms of style, the front bumper of the new Fiat Professional Fiorino has been completely refreshed in line with the sophisticated design language of the Fiat Professional range while retaining the high-mounted headlamps that are not only synonymous with the Fiorino's identity but also have a practical role in improving visibility and ensuring they are less susceptible to parking mishaps. New 15-inch wheel covers and 15-inch, diamond finish, burnished alloy wheels completes the external revisions. The new Fiorino retains its commodious, squared-off load compartment accessible thorough large rear doors that open to 180 degrees and have ergonomic vertical handles that are designed to be approached from either side and opened with minimal effort - very useful when the operator's arms are full! Functional options includes a folding, retractable passenger seat which can be used as a desk or folded flat to carry objects of up to 2.5 metres in length. The passenger compartment has also been revised to make it more comfortable and ergonomic than ever. The redesigned steering wheel is available with remote stereo controls and leather trim, as is and gear knob and boot. The instruments cluster gets new graphics with permanent backlighting for better visibility and a new, more functional storage compartment has been added to the dashboard. A new, five-inch, colour, touchscreen infotainment system is also offered for the first time, with Bluetooth, USB/AUX port and available satellite navigation and DAB radio. The comprehensive line-up of engines - all Euro 6 - can satisfy all needs. The range features two turbo-diesel 1.3 MultiJet II engines with outputs of 80 and 95hp as well as a 77hp 1.4-litre naturally-aspirated petrol unit. Both diesel engines are offer strong performance and cost-effectiveness, both in terms of fuel-efficiency and maintenance, while the new EcoJet version employs additional fuel-saving technologies such as a Start & Stop system, a "smart" alternator and a variable displacement oil pump. 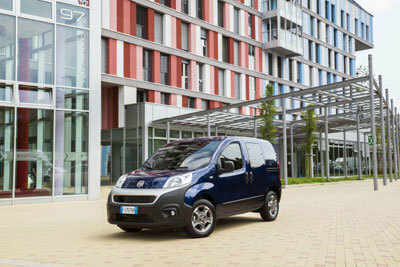 Paired with a Comfort-Matic robotised transmission – the only vehicle in the segment to offer such a transmission - the Fiat Professional Fiorino EcoJet is capable of 74.3 MPG (3.8L/100km) on the combined cycle with emissions of 100 grams of CO2 per kilometre, meaning a fuel saving of up to 14 percent compared to the manual transmission without EcoJet. The new Fiat Professional Fiorino offers all the safety systems of its predecessor, including standard ABS with EBD, ESC complete with ASR, HBA, and Hill Holder with parking sensors and front passenger and side airbags available as options. For drivers who need to tackle rough terrain or simply want to take on the winter weather with confidence, the Fiat Adventure offers 15-inch wheels with mud-and-snow tyres, a raised suspension, oversized body protection, a front bumper with skid plate and, of course, the Traction+ electronic differential lock system which assists driving in low-grip conditions. In addition to being the ideal vehicle for who wants a generous load compartment and needs to be agile in city traffic, the new Fiorino is also a great example of how Fiat Professional is a brand with a full line-up capable of satisfying the most diverse needs of all professionals. Available in Cargo and Combi body styles, orders for Fiat Professional's new Fiorino are now open priced from £11,315, excluding VAT and OTR charges.